Picture - Trident 1 G-ARPC at the SBAC Farnborough Airshow, 8 September 1962. The Hawker Siddeley HS 121 Trident (alternatively the D.H.121) was a British short/medium-range three-engined airliner designed by de Havilland and built by Hawker Siddeley Aviation in the 1960s and 1970s. The Trident is notable for its pioneering avionics which enabled it to become the first airliner to make a fully automatic approach and landing in revenue service in 1965 and to be the sole airliner capable of automatic landings in regular service from 1966 until versions of the Lockheed TriStar were also cleared to perform them in the mid-1970s. Designed very tightly around a British European Airways (BEA) specification, the Trident had modest sales, with 117 produced. The political and industrial aspects of its emergence, development, production, operation, and marketing were highly controversial in the 1960s and 1970s. Commentators have felt that the sales prospects and commercial usefulness of the type were gravely compromised because undue attention was paid to the needs of its launch customer who first insisted that it should be made much smaller than originally envisaged and who then insisted that it should be enlarged practically beyond the limits of its airframe and powerplant. BEA's successor, British Airways retired the type in the early-mid 1980s. In China the Trident remained active in Air China service until the 1990s. In April 1956, BEA's chief executive Anthony Milward stated that the Corporation "would rather do without [jet airliners]". Nevertheless, in July 1956, BEA announced what it called "outline requirements" for a short-haul "second generation jet airliner". The new type would work alongside BEA's turboprop airliners, carry a payload of some 20,000lb (9,000kg) or some 70 passengers over up to 1,000miles (1,600km), weigh about 100,000lb (46,000kg), use 6,000ft (1,800m) runways, cruise at the very high speed of 610 to 620mph (975 to 990km/h) and have "more than two engines". While not an express requirement, commentators ever since have taken these figures to constitute a definite call to industry. Four companies prepared projects to match the BEA views. Bristol proposed the four-engined (but ultimately three-engined) Bristol 200. Avro also proposed the four-engined Avro 740 which later became a three-engined design; the company eventually shelved its proposal and joined forces with Bristol and Hawker Siddeley. Vickers proposed a four-engined aircraft closely related to the future VC10 and designated the VC11. The de Havilland company considered three possible contenders for the specification. Two were four-engined developments of the Comet: the D.H.119 and the D.H.120, the latter also intended for offer to BOAC. The third, the D.H.121, was announced in May 1957, had three engines, and was the contender which eventually proceeded to bid for BEA's attention. In February 1958, BEA announced that the D.H.121 had come closest to its requirements and that it would order 24 with options on 12 more. It took a further six months for the British government to approve a formal BEA order for the D.H.121; the government had favoured the Hawker Siddeley Bristol 200 for industrial policy reasons. The D.H.121 was to be the world's first trijet airliner. Its designers felt this configuration offered a trade-off between cruising economy and take-off safety in case of an engine failure; moreover, the BEA specification had called for "more than two engines". Each of the three engines would drive its own hydraulic system, offering triple redundancy in case of any of the other two systems (or both of them) failing. The engines were to be 13,790lbf (61.34kN) Rolls-Royce Medways. The D.H.121 was to have a gross weight of 123,000lb (55,900kg) or optionally, up to 150,000lb or 63,000kg), a range of 2,070 miles (3330km), and seating for 111 in a two-class layout (or for over 140 in a high-density single-class layout as typical from the 1960s onwards on inclusive-tour charter flights). The design initially included a cruciform tail layout similar to that of the Sud Aviation Caravelle. The engines were clustered at the rear, with the centre engine situated in the extreme rear of the fuselage fed by air ducted through a large oval intake at the front of the fin, a configuration similar to the later Boeing 727 design. In time, the design settled on a variable-incidence T-tail with the centre engine situated in the tailcone, beneath the fin. From the outset, the D.H.121 was planned to employ avionics which were very advanced for the period. They were intended to offer the capability of automatic approaches and landings within a year or two of the airliner's service entry. The avionics were also to have triplicated components for reliability, and also to allow "majority 2:1 voting" in guiding the aircraft during automatic approaches and landings. The bulky size of the period's avionics required them to be housed in a large hold beneath the flightdeck floor; its size dictated a distinctive nose undercarriage design: offset by 2ft (60cm) to the port side and retracting sideways to stow across the D.H.121's longitudinal axis beneath the forward passenger vestibule. Through 1958, BEA management increasingly felt that the D.H.121's payload and range capacity would be too great and pleaded with de Havilland to reduce the design to fit its revised requirements. BEA's concern was due to three factors: a short-lived airline recession in the late 1950s; the imminent arrival into service of the turboprop Vickers Vanguard which duplicated the D.H.121's general payload and range area and the growing trend to higher-density seating. At the time, many reputable airlines were reducing their short/medium range seat pitches from the then-customary minimum of 36in (90cm) to 34in (87cm) or even less, while emergent inclusive-tour charter airlines installed their seat rows at yet shorter pitches. Although de Havilland stated that they generally concurred with these BEA views, upper management also stated that they had worked "under terms more onerous than anything D.H. had previously undertaken". Industry observers at the time felt that the British aircraft industry had again stumbled "into the pitfall of having designed exclusively for one customer an aeroplane that has potentially a much wider scope": a sentiment which would be echoed throughout the Trident's subsequent progress. It was, however, noted that de Havilland had not yet secured a formal and final BEA order and that its competitor Bristol was actively promoting their 200 project, which was significantly smaller than the D.H.121. At the time Boeing and Douglas were also downsizing their DC-9 and 727 projects and it was felt that the original large D.H.121 would have to compete against the Convair 880 and Boeing 720 some four years after their entry into service, whereas a cut-back design would be more competitive against the then-projected 75-100 seat, four-engined DC-9. The result of BEA's and de Havillands' concerns that the D.H.121 "had been allowed to grow too large" was a wholesale downsizing. Significantly, this involved changing the powerplant from the initial Medway engine to the 40 percent less powerful 9,850lbf (43.8kN) Rolls-Royce Spey 505. The gross weight was cut by about a third to 105,000 pounds (48,000kilograms), range was cut by more than half to 930 miles (1500kilometres), and mixed-class seating was cut by about a quarter to 75 or 80 (97 in a single-class layout). Wing span was reduced by approximately 17ft (5m), wing area by 30 percent and overall length by 13ft (3,9m). The revised design featured some items from the original larger one, notably the fuselage diameter. It had a smaller flightdeck and single-axis, two-wheel, four-tyre main undercarriage legs in place of the four-wheel bogies of its larger predecessor. . Fuller details, including particulars of the pioneering avionics fit, were announced to the public in early 1960. It was this aircraft which BEA ultimately ordered on 24 August 1959, initially in 24 examples with 12 options. The future airliner's name, Trident, was announced at the Farnborough Airshow in September 1960, reflecting its then-unique three-jet, triple-hydraulic layout. While the D.H.121 emerged in the late 1950s, British government policy on the aircraft and aeroengine industries posed a requirement that the then-many companies should merge to form a few large groups. De Havilland had accordingly consorted with Hunting Aircraft and Fairey Aviation to manufacture and market the D.H.121 under the corporate name of Airco, after Geoffrey de Havilland's defunct pre-First World War employer. The Minister of Supply, however, stated of the Airco consortium that "this is not quite what [he] had in mind". By late 1959, he had forced de Havilland to merge into the Hawker Siddeley group which until recently had promoted its competing Hawker Siddeley Bristol 200 project and publicly deprecated the D.H.121 project. The complex merger was completed by April 1960. Until its very eve, Airco executives intensively explored alternatives to the merger, such as the possibility that Boeing may drop its 727 project and instead manufacture Airco D.H.121s in the USA. This involved two Airco visits to Boeing and a return visit by Boeing executives and engineers. British commentators have tended to interpret this episode as involving the acquisition of sensitive proprietary data on the D.H.121 by a direct competitor..
After the de Havilland takeover by Hawker Siddeley, Airco was disbanded. Hunting was marshalled into the competing newly-formed British Aircraft Corporation (BAC). Their departure removed any putative possibility of the Hunting 107 (later the BAC One-Eleven) being marketed alongside the D.H.121 as a complementary, smaller member of the same airliner family. Fairey Aviation, partially incorporated into Westland Aircraft, also left the D.H.121 project. With the move to Hawker Siddeley Aviation, the designation eventually changed to the HS 121. By 1960, the cumulative delays to the D.H.121 programme from changes to BEA's requirements and British aircraft industry mergers had amounted to between two and three years. Nevertheless, for a year the D.H.121 was the first and only firm contender in a market segment so far unoccupied by an American or other product: that for a short/medium range, medium capacity jet airliner. The Trident was a jet airliner of all-metal construction with a T-tail and a low-mounted wing with a quarter-chord sweepback of 35 degrees. It had three rear-mounted engines: two in side-fuselage pods, and the third in the fuselage tailcone, aspirating through an S-shaped duct. One version had a fourth "boost" engine aspirated through a separate intake duct above the main S-duct. All versions were powered by versions of the Rolls-Royce Spey, while the boost engine was also by Rolls-Royce: the RB162, originally intended as a lift engine for VTOL applications. Picture - ex-British European Airways Trident 3B (G-AWZK) preserved at Manchester Airport, England. Delivered new in 1971, it flew for BEA and British Airways, retiring in 1985. The Trident was one of the fastest subsonic commercial airliners, regularly cruising at over 610mph (965km/h). At introduction into service its standard cruise Mach Number was 0.88/ 380kts IAS, probably the highest of any of its contemporaries. Designed for high speed, the wing produced relatively limited lift at lower speeds. This, and the aircraft's low power-to-weight ratio, called for prolonged takeoff runs. 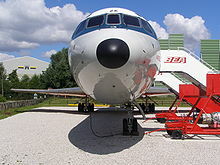 Nevertheless, the Trident fulfilled BEA's 6,000ft (1,800m) field length criterion and its relatively staid airfield performance was deemed adequate before the arrival into service of the Boeing 727 and later jet airliners built to 4500ft (1360m) field length criteria. The Trident was routinely able to descend at rates of up to 4500fpm (23m/sec) in regular service. In emergency descents it was permissible to use reverse thrust of up to 10,000 rpm. Below 280kt IAS, it was also possible to extend the main landing gear for use as an emergency airbrake. The Trident's first version, Trident 1C, had the unusual capability of using reverse thrust prior to touchdown. The throttles could be closed in the flare and reverse idle set to open the reverser buckets. At pilot discretion, up to full reverse thrust could then be used prior to touchdown. This was helpful to reduce hydroplaning and give a very short landing run on wet or slippery runways, while preserving wheel brake efficiency and keeping wheel brake temperatures low. The Trident had a complex, sophisticated and comprehensive avionics fit which was successful in service. This comprised a completely automatic blind landing system developed by Hawker Siddeley and Smiths Aircraft Instruments. It was capable of guiding the aircraft automatically during airfield approach, flare, touchdown and even roll-out from the landing runway. The system was intended to offer autoland by 1970. In the event, it enabled the Trident to perform the first automatic landing by a civil airliner in scheduled passenger service as early as 10 June 1965 and the first genuinely "blind" landing in scheduled passenger service as early as 4 November 1966. The ability to land in fog solved a major problem at London Heathrow and other British airports. Delays were commonplace when Category 1 (Cat 1 = 200ft (61 m) decision height and 600 metre runway visual range RVR) instrument landing system (ILS) was in use. The Trident with its autoland system pioneered the use of lower landing minima starting with Cat 2 (100ft decision height and 400 metres RVR) and going on to "zero-zero" (Cat 3B) operations. Because the Trident fleet could make operate safely to airfields equipped with suitable ILS installations, it could operate as scheduled irrespective of weather, while other aircraft were forced to divert. The Trident's advanced avionics displayed the aircraft's momentary position relative to the ground on a moving map display on the centre instrument panel. This electro-mechanical device also recorded the aircraft's track using a stylus plotting on a motor-driven paper map. Positional information was derived from a doppler navigation system which read groundspeed and drift data which, alongside heading data, drove the stylus. The Trident was the first airliner fitted with a flight data recorder. This sampled 13 variables, converted them into a digital format and stored them on magnetic tape for ground analysis. Hawker Siddeley Aviation, by this time, the parent of de Havilland, needed additional customers for the Trident, so entered into discussions with American Airlines (AA) in 1960. They demanded an aircraft with a longer range, which meant that the original DH121 design would have fulfilled American's requirements almost perfectly. To fill AA's needs, design began on a new Trident 1A, powered with uprated Rolls-Royce Spey 510s of 10,700lbf (47.6kN) thrust, and a larger wing with more fuel, raising gross weight to 120,000lb (54,000kg) and range to 1,800 miles (2900km). American Airlines eventually declined the aircraft in favour of the Boeing 727, an aircraft which filled the original DH121 specifications almost exactly. In fact, de Havilland had invited a group of engineers from Boeing to see the DH121 design and development program in its early stages, partly because Boeing was looking to develop a similar medium-range version of its 707 design. Some of these changes were nevertheless added into the original prototype, and it was renamed the Trident 1C. The main difference was a larger fuel tank in the centre section of the wing, raising weights to 115,000lb (52,000kg) and range to 1,400 miles (2250km). The first Trident 1, G-ARPA, made its maiden flight on 9 January 1962 from Hatfield Aerodrome, and entered service on 1 April 1964. By 1965, there were 15 Tridents in BEA's fleet and by March 1966, the fleet had increased to 21. Hawker-Siddeley then proposed an improved 1C, the Trident 1E. This would use 11,400lbf (50.7kN) Spey 511s, have a gross weight of 128,000lb (58,000kg), an increased wing area by extending the chord, and the same fuselage but with up to 140 seats in a six-abreast configuration. This specification took the 1C closer to the larger concept of the original DH121, but powered with 7,000lbf (31kN) less thrust. There were only a few sales of the new design: three each for Kuwait Airways and Iraqi Airways, four for PIA (later sold to CAAC), two each for Channel Airways and Northeast Airlines, and one for Air Ceylon. At this point, BEA decided that the Trident was now too short-legged for its ever-expanding routes, and that an even longer-ranged version was needed. Hawker-Siddeley responded with another upgrade as the Trident 1F. It would have the Spey 511 engines, a 2.8m fuselage stretch, a gross weight of 132,000lb (60,000kg) and up to 128 seats in the original five-abreast configuration. BEA planned to buy 10 1Fs, plus an option for 14 further aircraft. As work continued on the 1F the changes became so widespread that it was renamed the Trident 2E, E for Extended Range. Now powered by newer Spey 512s with 11,930lbf (53.1kN) thrust, it also replaced wing leading-edge droops with slats, and extended the span with Kx�chemann-style tips. It had a gross weight of 142,400lb (65,000kg) and a 2,000 mile (3200km) range. BEA bought 15, two were bought by Cyprus Airways and 33 by CAAC, the Chinese national airline. The first flight of this version was made on 27 July 1967 and it entered service with BEA in April 1968. Subsequently, the Trident was becoming the backbone of the BEA fleet and BEA wanted an even larger aircraft. Hawker-Siddeley offered two new designs in 1965, a larger 158-seat two-engine aircraft otherwise similar to the Trident known as the HS132, and the 185-seat HS134, which moved the engines under the wings and led to a modern-looking design very similar to the Boeing 757. Both were to be powered by a new high-bypass engine under development at the time, the Rolls-Royce RB178. 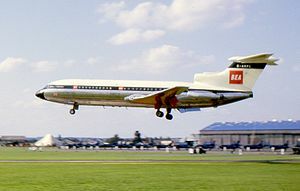 BEA instead opted for Boeing 727s and 737s to fill the role of both the BAC 1-11 and Trident, but this plan was later vetoed by the British government (the owners of BEA). BEA returned to Hawker Siddeley and instead chose a stretched version of the basic Trident, the Trident 3. This included a fuselage stretch of 5m for up to 180 passengers, raised the gross weight to 143,000lb (65,000kg), and made modifications to the wing to increase its chord. The engines remained the same, and BEA rejected the design as being unable to get off the ground in "hot and high" conditions, given that the 2E was having so many problems already. Since the Spey 512 was the last of the Spey line, extra power would be difficult to add. Instead of attempting to fit a new engine, which would be difficult given that one was buried in the tail, Hawker-Siddeley decided to add a fourth engine in the tail, the tiny RB162 turbojet, fed from its own intake behind a pair of movable doors. The engine added 15% more thrust for takeoff, while adding only 5% more weight, and would only be used when needed. BEA accepted this as the Trident 3B, and ordered 26. In some configurations, BEA (later British Airways) Trident aircraft had a number of rearward-facing passenger seats, an uncommon seating arrangement for civil aircraft. The first flight was on 11 December 1969 and the aircraft entered service on 1 April 1971. Addition of extra fuel capacity resulted in the Super Trident 3B, two of which were sold to CAAC. In 1977, fatigue cracks were discovered in the wings of the British Airways Trident fleet. The aircraft were ferried back to the manufacturer, and repaired, then returned to service. In total, 117 Tridents were produced, while the Boeing 727, built to the original airline specification for the Trident, sold over 1,700. Trident 2E G-AVFB at Duxford near Cambridge. Trident 3B G-AWZM at Science Museum's exhibit store at Wroughton in Wiltshire. Trident 1C G-ARPO at International fire training centre Teesside Airport, a project to save the aircraft and move it to the North East Aircraft Museum was started in 2009. Dismantling of the aircraft was scheduled to begin in September 2010. Trident 2E 5B-DAB at Nicosia International Airport (derelict). As of June 2009, the aircraft was still in existence, having stood for 35 years. Trident 3B G-AWZS at International fire training centre Teesside Airport (complete). Several aircraft or sections in use as fire service training aids and aircraft either preserved or in storage at various locations in China (three airframes, one with a broken back, can be seen at the Beijing Aeroplane Museum at Datangshan, north of Beijing). In 2008, the personal aircraft of Mao Zedong was offered for sale after a decision by merchants at a market in Zhuhai that the Trident, formerly a tourist attraction, was limiting business. On 3 June 1966, Trident 1C G-ARPY entered into a deep stall whilst on a test flight and crashed at Felthorpe, Norfolk, killing all four crew. On 3 July 1968, Trident 1s G-ARPI and G-ARPT were struck by Airspeed Ambassador G-AMAD, which crashed at London Heathrow Airport due to the failure of a flap operating rod. G-ARPI was severely damaged, but repaired and returned to service, whereas G-ARPT was written off. On 13 September 1971, a People's Liberation Army Air Force Trident 1E crashed in Mongolia under mysterious circumstances during an attempt by Lin Biao and his family to defect to the Soviet Union. Official PRC accounts claim that the Trident ran out of fuel. On 18 June 1972, British European Airways Flight 548, a Trident 1, G-ARPI, stalled due to pilot error and crashed at Staines shortly after takeoff from Heathrow Airport. All 118 on board were killed. As of 2010, it is still the worst aviation accident to have occurred on British soil (Pan Am Flight 103 was a terrorist incident). On 10 September 1976, a British Airways Trident 3B, G-AWZT, collided in midair with an Inex Adria McDonnell-Douglas DC-9, YU-AJR, over Yugoslavia, killing everyone on both aircraft. The 1976 Zagreb midair collision was attributed to an air traffic control error. On 14 March 1979, a CAAC Trident 2E, B-274, crashed into a factory near Beijing, injuring at least 200. The crash was caused by an unqualified pilot who stole and flew the airliner. Total fatalities were all 12 crew, 32 ground, and no passengers. On 26 April 1982, CAAC Flight 3303 Trident 2E, B-266 crashed near Yangsuo, China killing all 112 passengers and crew. On 31 August 1988, the right outboard flap of a CAAC Trident 2B hit approach lights of runway 31 of Hong Kong's Kai Tak Airport while landing in rain and fog. The right main landing gear then struck a lip and collapsed, causing the aircraft to run off the runway and slip into the harbour. Seven people were killed. Jackson, A.J. British Civil Aircraft since 1919, Volume 2. London: Putnam, 1973. ISBN 0-370-10107-X. Varley, Helen, ed. The Air Traveller's Handbook: The Complete Guide to Air Travel, Airplanes and Airports. London: Fireside Book, 1998. ISBN 0-671-24393-8.